With the rise of the machines, and I am talking machine learning and the AI, perhaps at some point we will be able to get robots to provide some deep tissue massage. We’ll quickly summon a perfect artificial masseur that will be familiar with our body. It would be more like a personal chiropractor. Having our physiological information stored in its database a proper alignment of the body’s musculoskeletal structure would be a piece of cake. Or rather a piece of software. But until then we still need to find that massage therapist that is available when we need help. Hence the online services. The apps are becoming more and more popular being downloaded by the billions. It is true, teenagers are leading the pack with most app installations and usage. Yet, slowly they are training the adults into this digital cornucopia of products and services. Mostly free. There are two distinct categories when it comes to apps or applications. There is the web app which is basically an application that is run in the browser and that can be on a desktop, laptop or a mobile device. And there is the mobile which is what it sounds like – an app built specifically for a smartphone or other devices such as tablets. There is a third type which can be run on a desktop but outside the browser but that market is barely making a difference. The app we are presenting today belongs to the mobile apps category. In fact it can be used inside a web browser as well but that is just a side fact and not of importance here. When it comes to mobile apps there two main providers or stores that eclipsed all the others. And you sure know which I am talking of: Google with its Google Play and the Apple Store. Of course there still are some other “insignificant” apps store such as Blackberry, Windows and Amazon. But again, their market share is almost invisible. Firebase is another Google product that is basically an “always online database” that stores objects in a Json-like format. What made it attractive was its real-time capabilities (at least it was marketed as such) and its packages that takes care of authentication. Authentication and security is always a difficult thing to build and maintain. By offering authentication as a service part of its database package Google made Firebase an attractive product. In reality there are issues but as with all software technologies they are quickly improving it. 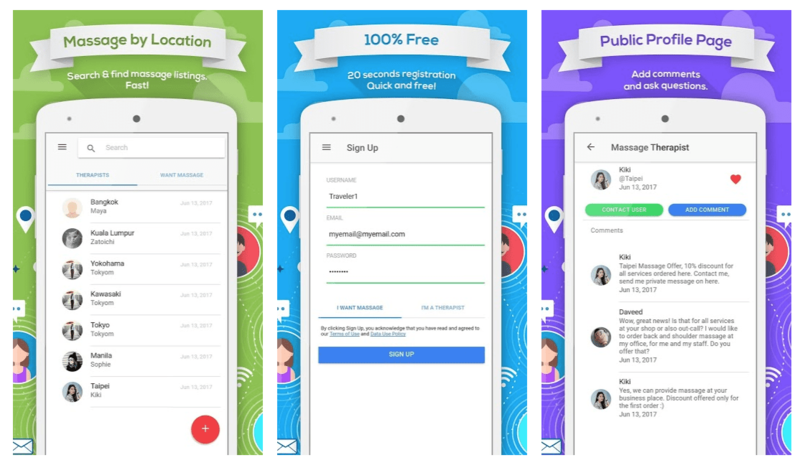 The Massage Booking Online App by Massage Open, is built in Ionic and Firebase and there are plans to launch a new version of the PWA (Progressive Web App) in Polymer which will be easily accessed in browser without the need of downloading or installing any additional software. The app appeals to those looking for massage therapists and don’t have the time to travel to a massage and/or spa establishment. Most of the certified massage therapists do house calls and Massage Open decided to list them in a database that can be accessed by all users free or charge. Most app users are registering from Asian countries such as India, Indonesia, Malaysia, The Philippines, Thailand, Myanmar. As we know massage is a lot more popular and more affordable in Asia. However recently a spike in registrations from Europe and the USA has been recorded. Main features are as listed below but Massage Open is continuously upgrading the application adding new features needed or requested by users. Signing up for the service is free of charge but does require an email address. Further profile enhancements can be made on the profile page. The app allows users to register as regular users (looking to purchase massage services) and as massage therapists. Massage therapists may add service listings (offers) in any location provided that ads are not duplicates. Regular users and therapists alike may contact each other inside the app via private messages or chat messages. Massage seekers may send a Booking Request to any therapist. In response the massage provider will respond with availability and details. The private messages (chats) will be sent to users via push notifications on smartphones and e-mail notifications. Such notifications may be turned off in the account. Both notifications are being sent with the help of AWS Lambda Serverless via a Sparkpost API. On the other hand the Booking Requests are directly sent as messages by a function in the Google Cloud Messaging. In short Google Cloud Messaging is easier to install and manage since it’s a one step application rather than using 2 separate entities such as AWS and Sparkpost. While there are things to be improved and the database to show more variety and options, we would recommend this application. In short the Massage Booking Online App it’s worth trying especially if you’re travelling to Asia and would like a quick way to book massage. As there are no cost to install or use the app and no advertising, it adds to the list of benefits. We have notice that the database is relatively current, and up to date. That means that you increased chances to get a response quickly. As of March 2019 the Massage Booking Online App can be installed only on Android smartphones after an easy install from Google Play. For additional info, feature details and an explanatory video you can access the massage app presentation here on the Massage Open website.